It's day 1 of My Creative Time's 73rd Edition Sneak Peeks! We have quite an adorable release to share with you this week! First off is Hey There Cute-Tea! This set is full of adorable sentiments and really cute images with coordinating dies. For my project today, I thought it would be fun to make a cute tag to tie on to a little gift mug of teas! For my tag base, I used one of the dies from Holiday Tags. I die cut it once from Papertrey Ink kraft cardstock and once from some fun patterned paper from the Simple Stores Harvest Love collection. The sentiment and adorable coffee cup, complete with tea bag tag are from Hey There Cute-Tea! I colored the cup with Inktense colored pencils. 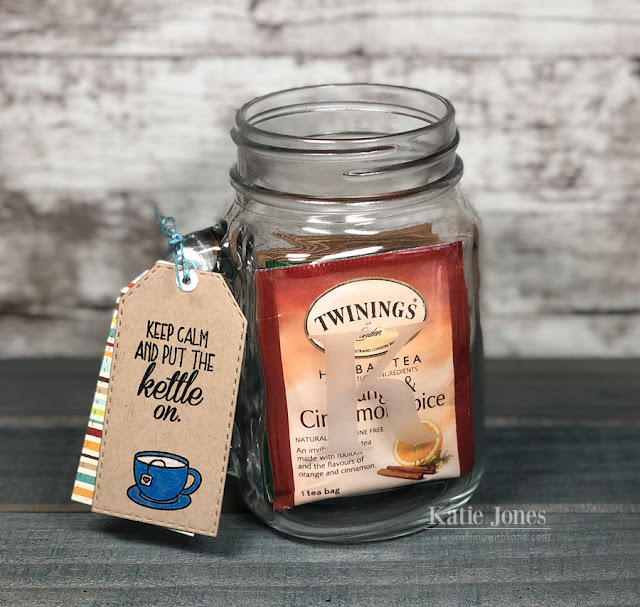 Great tag to go along with the jar of teas! Love it! Cute tag! I can almost smell that wonderful cinnamon/spice. OMG Miss Katey What an Adorable Gift!! Your ideas sure are fabulous and so showcase today's Sneaky Peek in one Spectacular way!! Love how you created your tag...so cute!! You sure did one Incredibly Super Outstanding Creative job!! YOU so ROCK!! I love this gift set that you made. Another really cute gift idea! Would love to receive this as a gift. Love your tags and sentiment. Great gift idea. What a great toad and gift. Love the blue tea cup. MCT 73rd Edition Blog Hop & Sale!